Chants and prayers echo through the extremely quiet valley as the sun wakes up and stretches itself across the horizon. The rays gently touch the earth and the magnificent landscape falls prey to our eyes. Our breathing slows down. Cold winds howl with no mercy. The roar of the Spiti river is heard at a distance. The beautiful barren mountains of the cold desert meets us, with a part of the Himalayas looking sleepily over its shoulder. This is Spiti valley; ‘Spiti’ literally means ‘middle land’ and rightly so, as it’s the land between India and Tibet. This r​egion possesses a very distinctive Buddhist culture and houses many centuries’ old monasteries. The Dalai Lama visits this quiet and stupendous valley from time-to-time as it houses two of his favourite monasteries, Ki and Tabo. 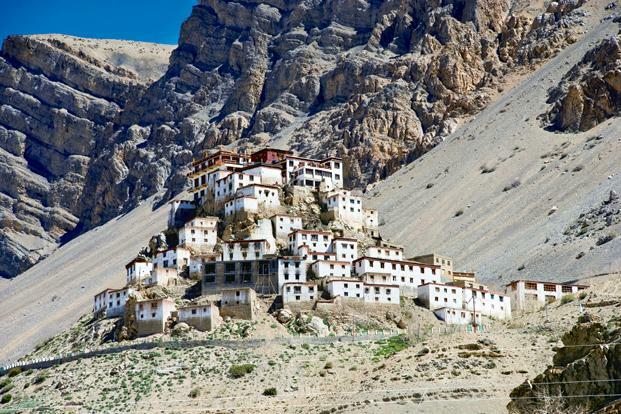 Spiti is a culture and research centre for Buddhists. So it makes a perfect place to get away from the humdrum of daily life and to really experience NLP in its raw form. We can learn so much from the mountains, monasteries and local culture. The valley lies in the north eastern part of Himachal Pradesh, a little hill district in India, and forms a part of the Lahaul and Spiti valley. Among the several monasteries that you will visit to explore the process of modelling, Key and Tabo are well known in the valley. They are important centres of learning to the Buddhists. Key, also known as Ki or Kee, is located on top of a hill at an altitude of 4,166 metres above sea level. It’s located in the Kibber village which is on the Spiti river. The monastery dates back to about 1000 AD, and is the second oldest in the valley. The place has withstood the test of time and has been damaged constantly due to war, fire and earthquakes. Tabo monastery lies in between Rekong Peo and Kaza. Legend has it that it is beyond 1000 years old, making it the oldest monastery in the valley. Exploring NLP on this desert mountain range will leave you feeling inspired, charged and in love with the abode of the gods!